TripAdvisor Data Missing in Google Analytics? Fix It! In mid-March of this year TripAdvisor changed the way it sends data for referral visits from its business listings and, as a consequence, referral data is lost in Google Analytics for many businesses. The reason for this is that TripAdvisor has moved to the HyperText Transfer Protocol Secure (HTTPS). Based on their current setup of this protocol, links to any external website that does not have HTTPS won’t receive the referral data in Google Analytics, meaning our client B&B innkeepers and dude ranches have lost valuable data to track the effectiveness of the dollars spent on having those links to their websites on TripAdvisor. If you discover that there is TripAdvisor data missing in Google Analytics you can take steps to re-establish that important data collection. In late March, White Stone Marketing contacted InsideOut Solutions and Acorn Internet Services to compare notes on TripAdvisor referrals and each of us noted the same situation: referral visit sessions from TripAdvisor stopped on or around March 15, 2016. It’s not just you. All of our clients receiving a high volume of TripAdvisor referral traffic stopped receiving that data on or about March 15. Why the change to HTTPS? TripAdvisor is following the lead of Google, Facebook and many other sites in making sure all data that transfers from their websites to your web browser is made more secure by HTTPS encryption. It is likely that HTTPS will become the standard for larger websites in the near future. This move by TripAdvisor is just the latest example. The reasoning TripAdvisor made the switch is sound, but unlike Facebook, Google, et al., the travel site has opted to not add a bit of code to their site which will allow the passing of referral data from HTTPS referring sites to non-HTTPS landing pages on other websites, which puts business listing managers in the position of having to jump through hoops in order to re-establish that flow of data. On top of that, TripAdvisor made this change without advance warning to its business listing customers, which is what led to all the confusion among business owners and online marketers. There is no implementation impact to site owners. No code changes are required. 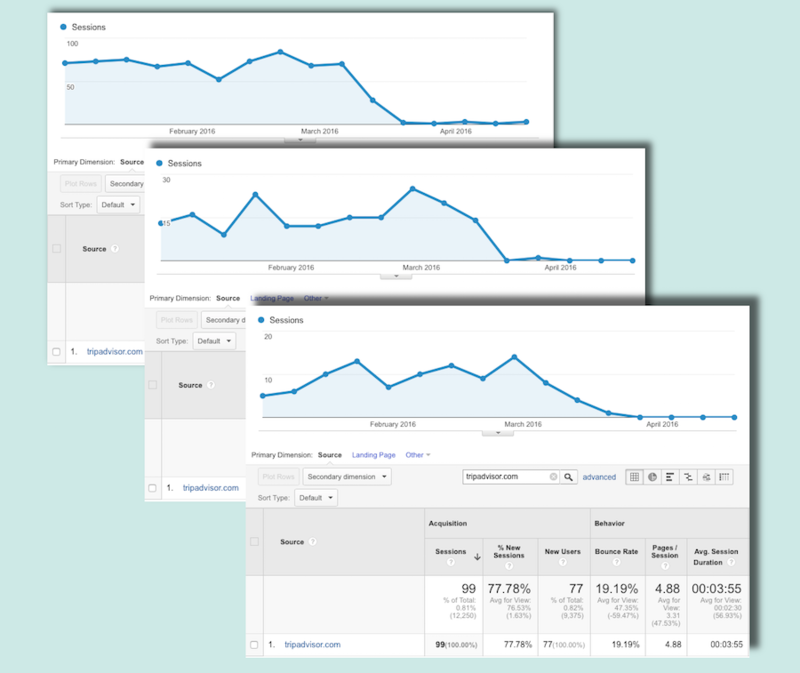 Google Analytics takes care of everything required to encrypt your traffic. It’s great to see Google is looking out for its Analytics users on this. An HTTPS certificate encrypts all data between your website and the visitor’s web browser. 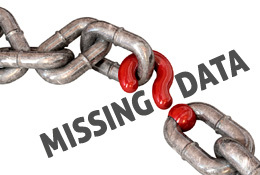 It will also fix the “missing data” problem from TripAdvisor or any other referrer that does not pass referral data to standard HTTP sites. Cost and difficulty in setting up HTTPS might be a factor in your decision, depending on your web hosting provider. InsideOut’s managed hosting clients may add this secure certification to their website – just contact us for a quote for the HTTPS upgrade. This no-cost (other than your valuable time) is to customize all links from TripAdvisor to your website(s) that use Google Analytics Campaign tracking code, which may be created with Google URL Builder. TripAdvisor’s instructions will change how the traffic data is categorized in Google Analytics. Google indexes these custom links, so all the traffic you get from them may not actually be from a TripAdvisor referral. Because Google indexes links to URLs with Campaign tracking codes, it’s possible that a user will actually get to you via a Google search result rather than from the TripAdvisor referral. Need help with the custom URL solution to TripAdvisor data missing in Google Analytics? If you are a managed web hosting client, we can assist setting up custom URLs on your TripAdvisor links. Contact us to learn how InsideOut can help with Google Analytics campaign tracking for TripAdvisor links. 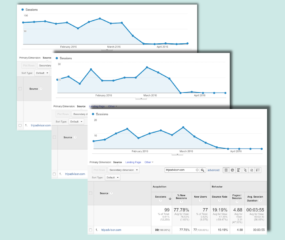 What do you think about the issue of TripAdvisor data missing in Google Analytics? By all means, tell us…but don’t forget to contact TripAdvisor Business Representative Support to give them feedback on their switch to HTTPS.